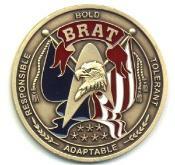 The Coin of the Military Brat recognizes the unique personal strengths of Military Brats and honors them for the great sacrifices they make by sharing their parents with the nation they have chosen to serve. These are sacrifices that Brats do not make by choice, but ones they accept with courage, love and dignity. The Coin of the Military Brat was developed to help commanders as well as soldiers, sailors, airmen, marines and coast guardsmen, at all levels, recognize and honor their family members for the strength and support they provide. It makes a priceless gift for presentation at hails and farewells, promotions, retirements or any other ceremony at which family members may be honored. Purchase the set which includes the parchment which can be personalized as a gift by adding the name of the recipient in the additional comments at checkout!